All week long, members of the PFF Fantasy team have been going out on their respective limbs. It’s bold predictions time, and we’ve had six different bold predictions all week long. They’ve followed different themes. From the general to the rookie-specific and even including devy and IDP leagues, the predictions have covered everything. And now, we’re wrapping things up — each writer has picked out his single favorite boldest claim of the year. Read below for everybody’s boldest calls, and click through for the full week of bold predictions. Freeman has not only been the best running back on the Broncos so far in the preseason, but he has thoroughly outplayed Devontae Booker, who is his primary competition for the starting role. Through two preseason games, Freeman has gained 58 yards on 10 carries (5.8 YPC) with two touchdowns with 3.7 yards after contact per rush. He did drop a pass, but he has shown well in pass protection, which will help keep him on the field in passing situations during the regular season. Freeman has avoided three tackles on his 10 attempts. Booker, meanwhile, has taken six carries for 24 yards (4.0 YPC) with a 2.7 yards-after-contact average. He hasn’t scored, and he also has just one reception. Booker has forced no missed tackles on his attempts. In fact, he forced just seven missed tackles all of last year. Royce Freeman has forced 3 missed tackles on 10 attempts in the preseason. Devontae Booker forced 7 missed tackles all of last year. We don’t want to put an abundance of stock into these touches, but considering that the Broncos are trying to shape up their backfield, we can’t overlook the fact that Freeman has looked the part. If Freeman takes up the C.J. Anderson role, a top-12 fantasy finish is within the realm of possibilities. Anderson was the RB18 last year after posting a line of 245-1007-3 with 28-224-1 through the air. Freeman could eclipse those numbers — especially in the touchdown department. I’m low man out of just about everyone on Watson, ranking him 11th in my quarterback rankings — he’s no worse than seventh in anybody else’s rankings at PFF and going second in ADP. But I think Watson investors are in for a rude awakening in 2018 after he had an unsustainable touchdown percentage in 2017 (he threw a touchdown on 9.3 percent of his passes last year, higher than any other quarterbacks touchdown­­-plus-interception percentage). That will drop. It would have dropped if he had played all of 2017, and we wouldn’t have that ridiculous per-game rate to look back on. He was PFF’s 30th-graded passer in 2017, worse than Eli Manning, Ryan Fitzpatrick, and Brian Hoyer. His stable of weapons is poor (after DeAndre Hopkins, his pass-catchers include Will Fuller and a bunch of guys who will literally sit on your waiver wire all year long), his offensive line is pretty easily the league’s worst, and he’s recovering from his second torn ACL in four years. Watson is in line to be the biggest bust of 2018. Kenny Vaccaro will outscore teammate and top-five 2017 DB Kevin Byard in 2018. Yes. I realize that Titans S Vaccaro has never finished higher than a DB2 in his career but there are times the fantasy chips just fall a certain player’s way. Vaccaro landed in the perfect spot for fantasy purposes in early August. The season-ending ACL injury suffered by Johnathan Cyprien left a huge hole in the secondary and Tennessee moved quickly to sign Vaccaro as their starting strong safety. Groin and wrist injuries ended Vaccaro’s 2017 season after Week 15 (his best fantasy outing) — injuries have been an issue in his first five seasons. Due to a combination of suspension and injuries, Vaccaro has missed 12 games to date. For this prediction to come to fruition, he will need to return to the form he showed in 2015. In the lone season he played 16 games, Vaccaro finished with 104 total tackles, three sacks, and a forced and recovered fumble. The totals were good enough for a solid DB2 finish. Vaccaro will be used in a run-support role as Byard patrols the secondary and that bodes well for his fantasy production. The main reason I believe Vaccaro will out-produce Byard is that it’s difficult to imagine Byard putting up another eight-interception campaign. 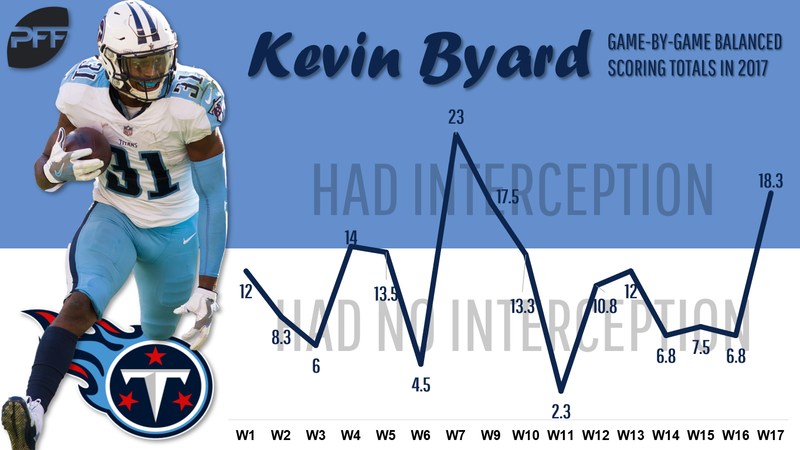 Furthermore, Byard’s success in 2017 mainly came in just the four games he had an interception. Those were the only double-digit fantasy games Byard had; there were eight games that Byard scored fewer than six points in most balanced scoring formats. This will be a big deal considering there are roughly 15 wide receivers picked after Thomas and before Sanders, and the difference between burning a fourth-round pick and a seventh-rounder is significant. Even scoring in the same ballpark makes their relative average draft position seem ridiculous, but it will look worse when Sanders scores more. Both wideouts had down seasons in 2017 due to several factors, with abysmal quarterback play vying with injuries for the main culprit. Missing four games led to Sanders’ dropoff from three consecutive 1,000-yard seasons, but Thomas’ accumulated nagging ailments held him back as well. The former size/speed specimen, who has recently mulled retirement, is again nicked up and has readymade replacement Courtland Sutton lining up on the opposite perimeter, with Sanders manning the slot (53 percent of preseason routes, versus only 27 percent last year). Case Keenum, who thrived when targeting the slot last year, is an upgrade for all Broncos receivers, and Sanders is better-positioned to take advantage. The second-year running back is staring a massive workload in the face in 2018 following a 197-touch debut season that saw him finish as PPR RB9. 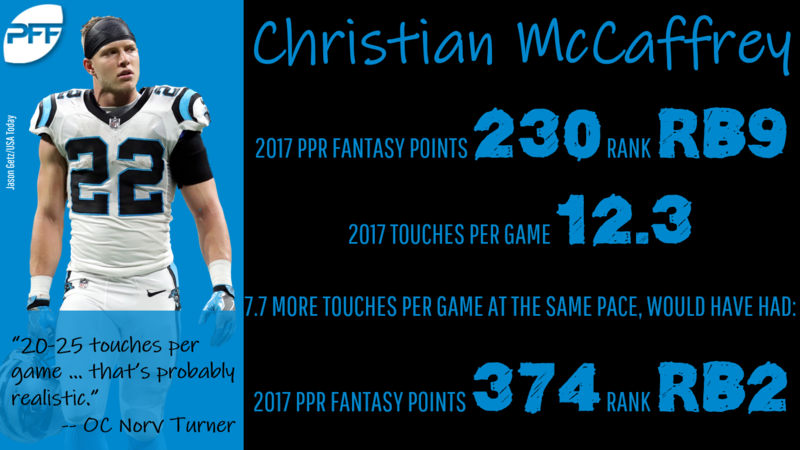 McCaffrey led the position with 106 targets in 2017 but ranked just 39th in carries with 117. New Panthers offensive coordinator Norv Turner reiterated that the team would like to see McCaffrey touch the ball at least 20 times per game. If this happens, the back will get at least 123 more touches than he did in his rookie season. The team has featured McCaffrey heavily with the first-team unit throughout the preseason and Turner does have a history of establishing bell-cow running backs. With Le’Veon Bell and David Johnson turning 27 before the 2019 season, dynasty players will start to move them down the boards in favor of backs from the past few classes. Inspired by a stellar 2018 season in which he adds a rushing ceiling to his receiving floor, drafters will vault McCaffrey over Melvin Gordon, Dalvin Cook, Kareem Hunt, and Leonard Fournette in ADP in addition to the aforementioned backs. Nearly breaking the boldness Richter scale, not only does Gronkowski finish as this year’s top fantasy tight end, he sets the record for most touchdowns ever recorded at the position. If he can remain healthy, Gronkowski has the potential to rewrite history books. He already owns the record for most touchdowns by a tight end (2011) as well as three of the top-10 highest-scoring fantasy seasons by a tight end in NFL history. 2011’s success came when the Patriots had just one reliable receiver (Wes Welker) and the team opted for running out of mostly 12 personnel (two tight ends). This was the year that Gronkowski and Aaron Hernandez took the league by storm (finishing as TE1 and TE3), while Welker was the WR2. More than two-thirds of Tom Brady’s dropbacks had him targeting one of these three receivers, and we can draw some parallels to this 2018 roster. Brady once again has a plethora of short-to-intermediate passing options to target — Gronk, Julian Edelman, Jacob Hollister, James White — while Chris Hogan clears out space. Multiple targets over the middle will cause headaches for defensive coordinators trying man-to-man coverage. Zone coverage? Brady’s accuracy (76.0 percent, sixth-highest last year) will tear that defense to shreds. The Patriots have let Brandin Cooks, Danny Amendola, Kenny Britt, and Dion Lewis walk. Edelman will be out the first four games with a suspension. 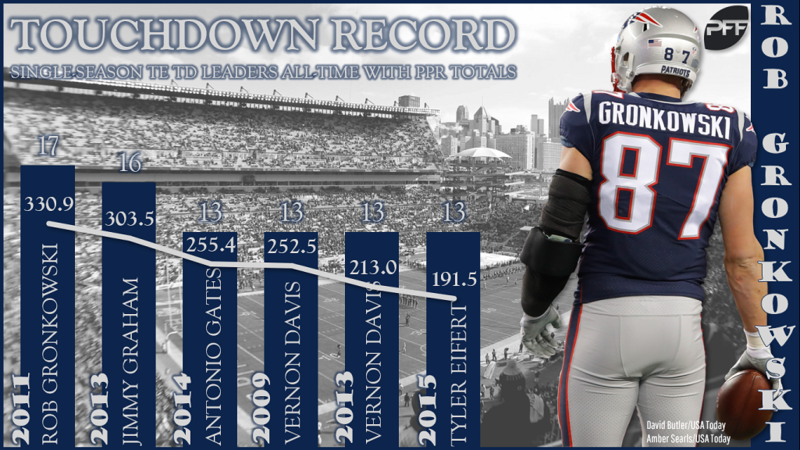 Gronk should see the requisite volume to beat his previous record. With a path to targets established, it comes down to red-zone usage. No team ran more plays in the red zone than the Patriots last year (200). In fact, New England has ranked top-five in number of red-zone trips per game each year dating all the way back to 2005. New England is one of the more well-balanced teams when it comes to run-pass ratio in the red zone, but Gronkowski has more than doubled his teammates’ touchdowns scores here in the past four years despite missing 12-of-64 games. He’s also proven to be no stranger to long touchdowns via seam routes. Whether this team is up by a touchdown, down by a touchdown, or in neutral game script, the Patriots pace of play (top-five in each) gives them more raw opportunities than most other teams to collect these types of counting stats. If healthy, Gronkowski’s volume and role in the Patriots offense could lead him to shattering his previous touchdown record and scoring 20 times this season.